Indoor cycling is a fast, efficient way to get fit – and though you don't get to smell the roses, there are plenty of ways you can keep it interesting. Most cyclists would like to spend the majority of their time on the bike spinning down country lanes or sprinting up the natural interval facilitators that nature intended. However, it’s not always possible – sometimes indoor cycling is the best, or the only, way. Taking your cycling indoors means a lack of freewheeling, thus you’re utilizing every pedal stroke towards your end goal, be that greater all-over fitness, weight loss or preparation for a target event. There are no cars or junctions, which means that intervals can be completed with your full attention placed on the effort, and it’s unlikely that you’ll be rained on when riding indoors which is a plus for most of us. Turbo trainers can be set up in your own home. You can pick up a basic turbo trainer for as little as €100 (though spending more will give you a more realistic pedal stroke) – you simply clamp your wheel in to one of these and pedal away, using the gears or inbuilt resistance controls to up the effort. Turbo trainers can cost in excess of €1,000. Smart Turbo Trainers start at around €250 and use Bluetooth (or ANT+) to interact with apps like Zwift, TrainerRoad, The Sufferfest, BKool – either to suit intervals or to replicate hills on a given virtual route. In the case of Zwift, the effect of drafting will also be recreated as you ride with others in the virtual world. Smart Turbo trainers can be direct drive, meaning the wheel is removed and the bike is attached to a cassette mounted on the turbo. These offer a more realistic ride feel and save your rear tyre from wear – though at present the flywheel means they’re quite heavy. Rollers are also easy to set up in your home, but they require a little bit of skill to ride – though most people pick it up after a few tries. 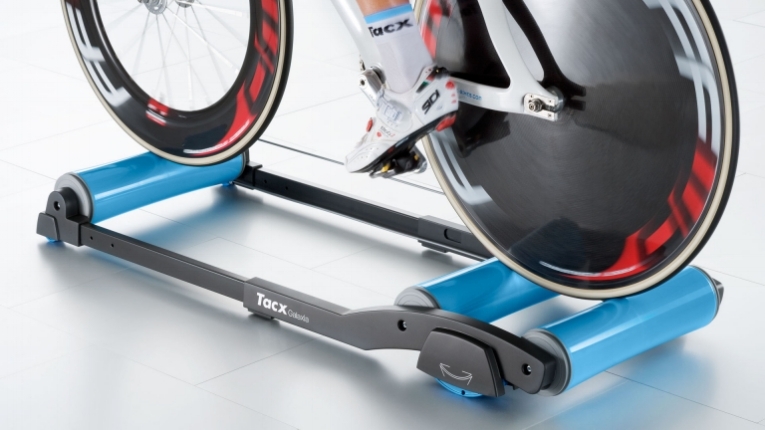 Rollers start from €179, and traditionally they’re fairly basic – three drums set up with a cable linking them together, allowing them to turn below the wheels. Contact us to find the most suitable home setup for your own indoor training needs. Some products require ordering ahead of collection in-store.